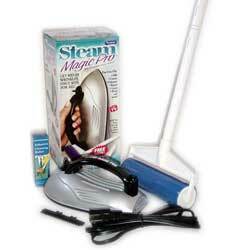 With the Steam Magic Pro there’s no need to drag items to an ironing board and press them with a heavy iron. Just add ordinary tap water and a dash of salt and watch the Steam Magic Pro work on almost any type of fabric, from fragile silk to heavy denim without burning, scorching or shining. You can even steam wrinkles out of a shirt without taking it off the hanger. And it’s great for decorated materials, as it won’t melt glues, paints, or plastic. It’s lightweight, compact, and perfect to take with you when you travel.